You are at:Home»Herbs»Ficus racemosa Linn. 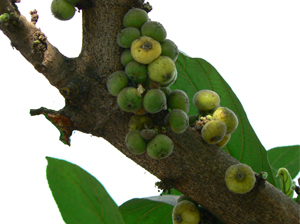 Latin name : Ficus racemosa Linn. Description : The root-bark is antidiabetic, antidysentery, astringent, diuretic, exhilarant, expectorant, refrigerant, stomachic, styptic and vermifuge. It is a good remedy for excessive appetite. Also used in diabetes, leucoderma and menorrhagia.